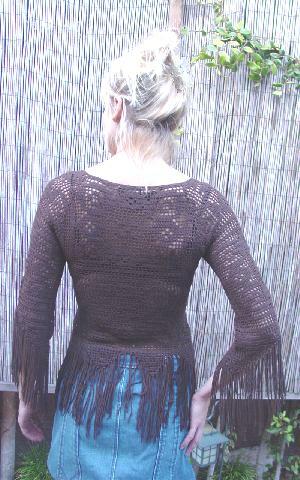 This dark brown soft knit fringed blouse is 71% rayon and 29% nylon and is by bebe. It has a see-through box pattern, a wide V drawstring neckline, and raglan 3/4 length sleeves with angled bottom edges and 7" long fringes. The knit bottom has a zigzag design with 6 3/4" thin fringes. The tag says size small. It fits like a size XS/S. It was worn once (besides for these pictures), for a magazine photo shoot. shoulder to bottom of knit 18"
shoulder to bottom of fringes 25 1/4"